I hope that everyone is having a great holiday season this year and that you are able to spend time with your family and friends. Initially I was going to take the holiday off for some much deserved rest, but on Christmas Eve I received a small little package in the mail, and figured today was the perfect day to write about it. A friend of mine from high school moved to California for college and has been living there ever since. We don’t get to talk much but he knows about my pressed coin obsession and is himself an avid Disneyland fanatic. Each time he visits the parks in Anaheim he always sends me a quick email asking if there are any new coins I need for my collection. I am certainly a very lucky collector to have such dedicated friends. Now this package that arrives yesterday had his familiar return address with a small Mickey Mouse silhouette by his name, but I hadn’t been anticipating any new coins because Disneyland has been on a bit of a slump for new coins these last few months. Figuring the envelope just contains a holiday greeting card I tore it open and to my surprise out slid a small zip bag with three shiny pressed nickels. I had to look this up but wanted to pass the information along for any collectors reading this. This temporary machine was located by the Exit to the Main Street Opera. The designs are: Santa Mickey, Happy New Year 2015 Chip and Dale, and Happy Holidays Olaf from Frozen. There was a nice little note inside as well that wished my family a happy holidays and hoped that I hadn’t already received these coins (I hadn’t even know these were out yet). He did mention that he was trying to surprise me and had been visiting a website I usually check out for new Disneyland coins. They listed these coins one day a week or so ago and he immediately ran over to the park to press them for me. He also said that there are rumors of two additional holiday sets being released and that he would press those for me a well one they are available. As soon as the additional coins arrive I will be sure to post them so you can see them. 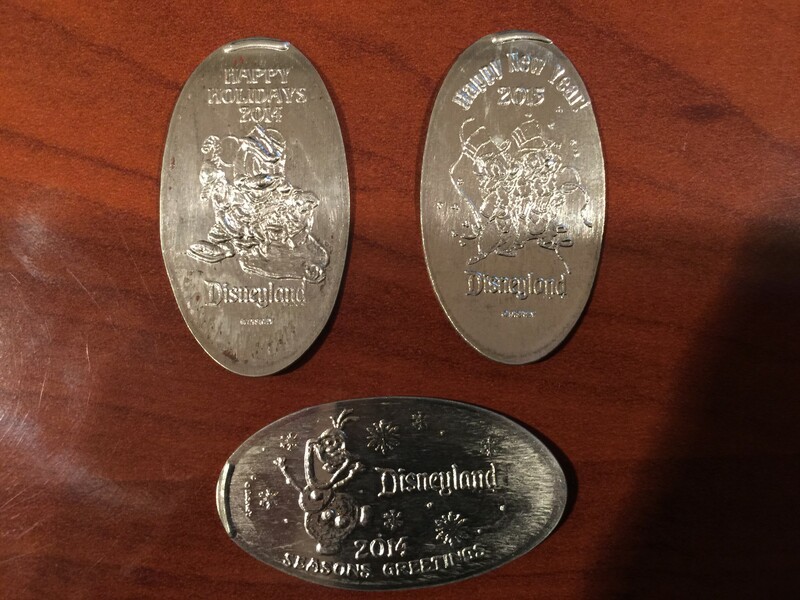 These Disneyland Holiday coins have been an annual tradition for the last few years. I think I saw the first ones were issued in 1995. I have only recently started collecting these but they are really cool and in very short supply since they are only available during the holiday season before being retired. I’ve only collected the last couple years but am slowly working on trying to get as many as I can. Have a safe holiday season, and a happy New Year. 2015 will hopefully be another big pressed coin year!! Can’t wait to see what we can find.